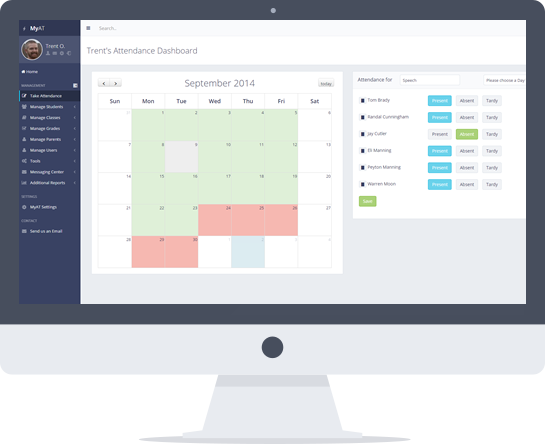 You can signup and start tracking student progress for free in literally less than a couple of minutes. Entering your historical student data is as simple as importing it in a couple of clicks and you can see information on their past attendance and grade progress either on thier individual student profile page or by running a fully customizable student report. From there you can quickly assess if each student is on track to succeed in you class. Fast insight into exactly how students are progressing in each of their classes. Know before it's too late if any students need more help based on tracked assessment scores. Integrated reporting to get all of the information back from your tracking easily. Clean and consise dashboard and student profile pages give you trends at-a-glance. For all of the benefits I have tried to build into MyAT over the years, the abiltiy for instructors and teachers to quickly and accurately assess student progress is probably the most important. When teachers can proactively see when students are not progressing as they should or could, and can act on those insights, has the ability to transform educational system shortfalls more effectively than any other tool or process ever can. When teachers have not only the data informing them of potential issues but the experience in the classroom of how each student is navigating materials and engaging, they can be more active where necessary to help prevent students from falling behind before it becomes a bigger issue.